Here’s another image from my workshop last weekend where I shot only in black & white. If you missed that post you can find it here. I really liked this tree (which was in the parking lot by the way…so don’t put your camera way when you’re walking back to the car) and I wanted to give it more of an artistic treatment. 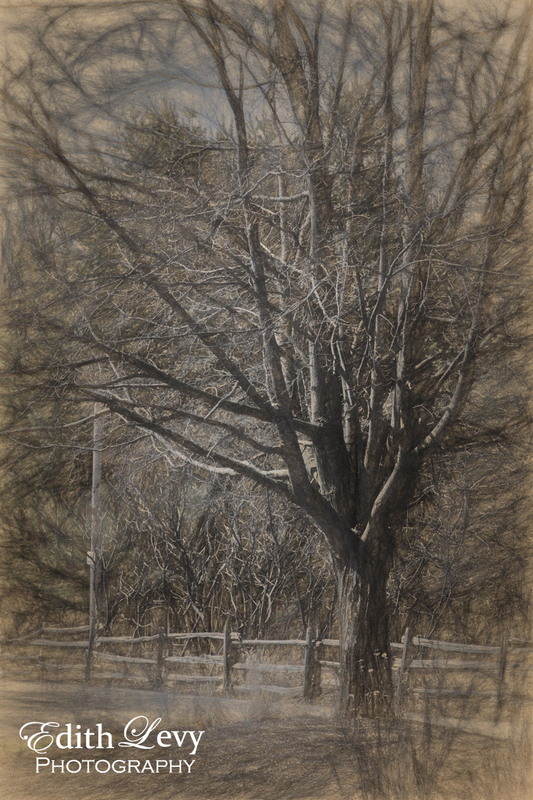 I used Topaz Impression to create this pencil drawing look. You can always save 15% by using the discount code ELPHOTO. This entry was posted on May 1, 2015 by edithlevyphotography. It was filed under Around Toronto, Black & White and was tagged with 7D, Canon, Kortright Center, monochrome, Topaz Impression, Topaz Impressions, Topaz Labs, Toronto, tree. Wow! Gorgeous, love the atmosphere! Have a nice week-end, the sun is here! Yayyy! Thanks Anne. I know I’m very excited about the sunshine and warm weather we’re getting. Have a great one too. You could take a photograph of a single grain of sand and I’d view it. You’re so kind. Thank you very much. Stunning image Edith! I like it very much indeed! Great processing – I like the palette you have chosen to add atmosphere. Thank you so much Noeline.